Why not open your drink with one these awesome bottle openers, we’ve chosen our favorite bottle opener, which one is yours? This Batman symbol not only opens bottles but can also be used as a screwdriver. It also comes with a key chain so you can carry it around with your keys. Unlike the classic green army men this soldier is made from cast metal and uses his gun to open bottles. This awesome stainless steel ace of spades card is great for opening bottles and because of its slim shape it can easily fit in your wallet. This copper plated mini shovel is a unique bottle opener that also looks cool as a fridge magnet. This bottle opener is actually made from a real .50 caliber bullet. What better way to look hard in front of your mates than opening a beer with a bullet. 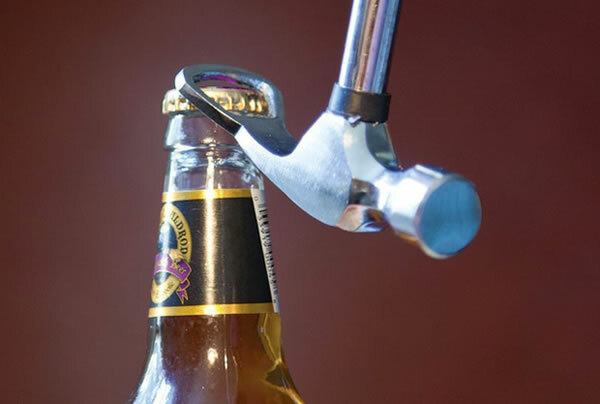 This hammer not only hits nails but also doubles up as cool bottle opener. Another great bottle opener for the Batman fan is this awesome die cast Batmobile, not only would it look cool stuck to your fridge but it would also be fun to open beers with it. This is one of my favorite bottle openers on the list, it features a stainless steel blade and silicone hilt for an easy grip when you want to slash open a beer. This mini Star Trek Enterprise model would make an awesome gift for any Trekkie fan and even has the NCC 1701 number which classifies it as the original Enterprise that was commanded by Captain Kirk. Open your brews with the fastest hunk of junk in the galaxy, this is a must for any Star wars fan. When you want a beer who you gonna call? The one with the Ghostbusters bottle opener of course. Have a great sense of humor? Than give your friends a poop emoji to crack open their bottles. But this doesn’t come cheap, it is made from solid gold and comes with a price of US$10’000. Nearly all the bottle openers in our list are available from Amazon.com .